(16/P68) TRENTON – DEP Commissioner Bob Martin today joined Ocean County and local officials for a ribbon-cutting ceremony dedicating the official opening of a new gazebo at Barnegat Lighthouse State Park, the result of efforts by the State Park Service and the park’s official Friends’ group to create a new amenity for events and celebrations at the landmark on the northern tip of Long Beach Island. The gazebo, along the water and near the 157-year-old lighthouse, is evocative of the pavilions built and used in the 19th century, when the lighthouse was constructed. It will be used as a location for weddings and other special events, as a bandstand for summer concerts, as well as for general visits. Today’s ceremony also occurs on the 65th anniversary of the signing of the New Jersey Legislature’s bill creating the destination as a state park. 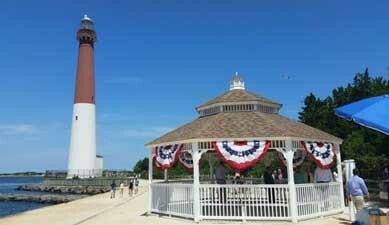 The $130,000 gazebo project was the result of an agreement between the Friends of Barnegat Lighthouse State Park and the DEP’s Division of Parks and Forestry. Commissioner Martin honored the Friends of Barnegat Lighthouse State Park, an Officially Recognized Friends Organization with the state of New Jersey, with a certificate of appreciation for its continued dedication to protect, preserve and interpret the park. The Friends of Barnegat Lighthouse State Park offer volunteer staffing of the Interpretive Center, which enabled nearly 582,000 visitors from around the country and the world to experience the park’s history last year alone. The site of Barnegat Lighthouse on the northern tip of Long Beach Island in Ocean County was regarded as one of the most crucial "change of course" points for coastal vessels. Vessels bound to and from New York along the New Jersey coastline depended on the Barnegat Lighthouse to avoid the shoals extending from the shoreline. The swift currents, shifting sandbars, and the offshore shoals challenged the skills of even the most experienced sailor. The park is included as a maritime site on the New Jersey Coastal Heritage Trail. A panoramic view of Island Beach State Park, Barnegat Bay, and Long Beach Island can be seen from the top of Barnegat Lighthouse, 175 feet above sea level. The lighthouse is open daily from 10 a.m. to 4:30 p.m. (weather permitting) from Memorial Day through Labor Day. There is a $3 fee per person to enter the lighthouse. Children ages 6 to 11 are $1 and children ages 5 and under are free and must be accompanied by an adult.